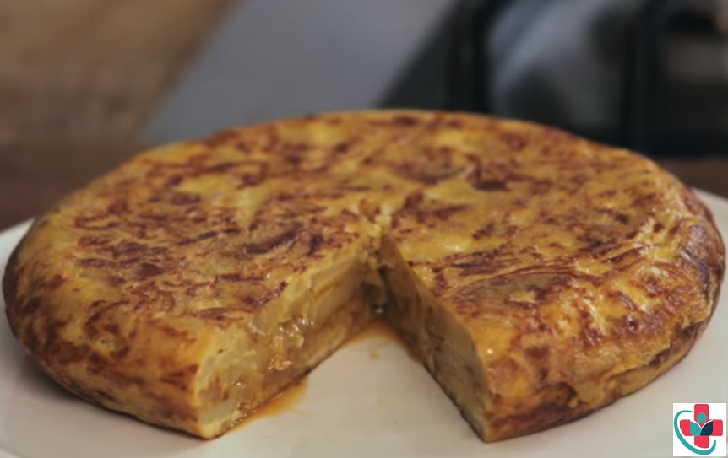 Spanish omelet is a classic Spanish staple for good reason. Made lovingly with just a few ingredients, it makes a perfect light meal – and it’s definitely posh enough to serve to guests. Very basic few ingredients and easy preparation providing incredible taste and texture. Each person likes it differently: runny, completely cooked through, with or without onion, thick or thin. The trick is to use good quality ingredients (especially important is the oil) and to find the way that suits you best. The ingredients amount below feeds 2 people. You can easily adapt the amount depending on how many people you expect to come. You can prepare bigger omelet in a larger pan or several small ones. Along with a salad, it makes a perfect dinner. As an appetizer for parties, you can cut it into cubes so everyone can taste it. Enjoy! ⏩Heat a generous amount of olive oil in a pan. The amount should be enough to half-cover the potatoes and the onion. Fry for about 5 minutes at high heat. Add salt and cover reducing to medium heat. Keep stirring once in a while. When potatoes are almost cooked, cook at high heat for other 3-4 minutes to create nice golden brown color. Strain the potatoes and keep aside. ⏩Beat the eggs with some salt and add the potatoes; mix well. Heat the pan with some oil drops to avoid sticking and once it is hot pour the mixture. Keep moving the pan and reduce to medium heat. ⏩After 5 minutes (it depends entirely on the thickness of the mixture and on your taste) flip it over and transfer again to the pan. Cook for 3-4 more minutes and the omelet is ready to serve. It can be consumed fresh made or cold. Even the day after tastes delicious.